Since then we have had a tumultuous time in politics, including a new PM, kicked off by the failure of yet another attempt at a national energy policy. And the news on our looming climate catastrophe has only got worse. Globally renewable energy is leaping ahead with a clean energy transition well underway. But not in Australia, even though a recent CSIRO report has established that renewables and storage is clearly the cheapest and most effective form of energy to add to our grid. What really is going on? 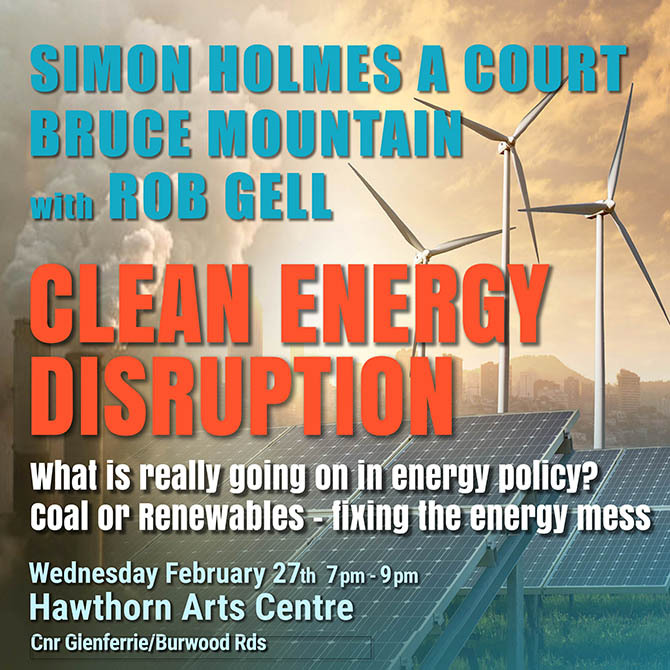 Come to our expert forum on 27th February, 7pm, at the Hawthorn Town Hall for the inside story from energy experts Simon Holmes a Court and Bruce Mountain, joined by media icon Rob Gell.